Installing a ceiling fan adds style and lowered energy costs to your home! It’s almost August on the east coast and I’m sure you’ve felt the heat! With temperatures skyrocketing to over 100 degrees and the suffocating humidity through the roof lately, your HVAC system needs to work much harder. When the temperature rises outdoors, indoor air temperature does the same. To cool it down a bit and take the workload off your central air system, installing a ceiling fan is your solution! Cool down by getting that stifling air circulating and enjoy your indoor breeze while seeking refuge from the sweltering heat. High energy costs are inevitable when outdoor temperatures rise. Beat the heat with ceiling fan installation! Proven to lower your monthly energy bill by 30 to 40 percent, the draft from the rotating blades will make your room feel cooler. When internal air quality is comfortable, you can raise your thermostat 2 to 3 degrees, exponentially saving you much more money. Different fan models actually use low amounts of electricity, while providing the same high functionality. With less energy used to power the fan itself, and the added cooling which gives your HVAC system a break, your wallet will thank you. Take advantage of these savings before it’s too late by hiring an electrician for your ceiling fan installation today. Your new ceiling fan isn’t just for cooling off this summer. Get creative with it! With a variety of different styles and lighting options, choose the fan that tastefully matches your interior design! Ceiling fans are more than just a functional bonus. The right ceiling fan installation can serve as a statement piece, focal point, or elegant accessory. With interchangeable blade sets, you can easily reinvent the style of your fan whenever you wish! The benefits and added functional purposes of ceiling fan installation greatly outweigh their cost. Install one today with the help of your local, trusted electrician. Call TriStar Electric for ceiling fan installation today! 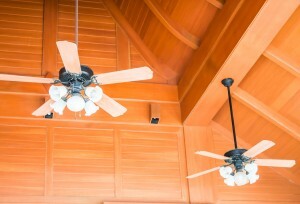 If you have any questions about ceiling fan installation or energy efficient air and lighting options, or if you have questions related to your generator, please contact TriStar Electric, Maryland’s premier residential and commercial electrician, by calling 410-799-5791 or 301-384-8880. Or, you can fill out the contact form on our website. This entry was posted on Monday, July 25th, 2016 at 8:23 pm. Both comments and pings are currently closed.